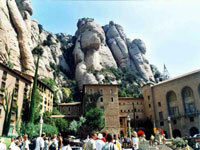 One of the most visited sites in Catalonia is the monastery at Montserrat, 35 miles (56km) northwest of Barcelona. The monastery is surrounded by strange rocky crags and caves, and was founded in 1025 to celebrate local visions of the Virgin Mary. It has become one of the most important pilgrimage sites in Spain, sitting atop a 4,000-foot (1,200m) high mountain and housing about 80 monks. Its main claim to fame is a 12th-century Romanesque wooden sculpture of a black Virgin Mary, known as La Moreneta, which thousands come here to see and touch. There is lots to see at Montserrat, which has a fascinating museum housing masterpieces by artists like Caravaggio and Picasso, as well as exhibitions on the history of the sanctuary and the wider culture, religion and history of Spain. It has been traditional since the Middle Ages for young people from Barcelona and surrounding regions to make the pilgrimage to Montserrat and watch the sunrise from the heights at least once in their lives. The hike to the monastery is still popular for both pilgrims and travellers: there are several possible walking routes described on the website. The monastery on its mountain perch is most conveniently reached by cable car, with the short journey providing passengers with epic views. Opening times: Opening times vary according to section and season - check the official website for details. Admission: Entry to the monastery is free, but the funicular ride to the Holy Grotto is €10 (return).